Their is a long tradition of choral singing in both liturgical and secular Jewish culture and there is a wide selection of Israeli songs arrangements. Though Arabic choral music has a long history in the Arab world, the non-Arab world is just beginning to engage with the genre. Displaying 1-4 of 4 items. 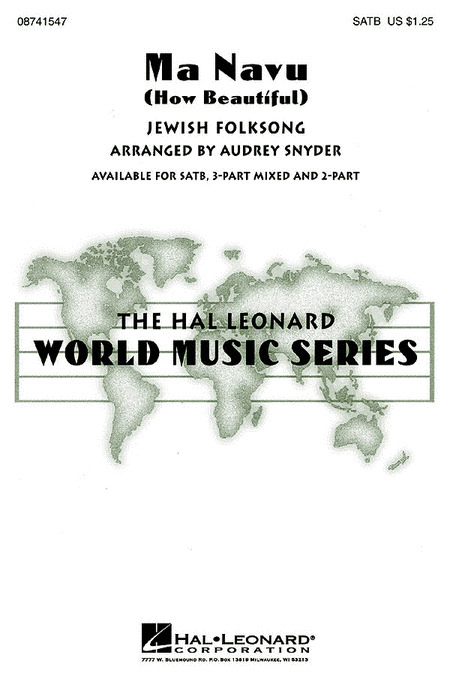 This one-of-a-kind collection features newly-composed rounds by prominent Jewish composers as well as traditional folk pieces. Great for school, temple/church and volunteer choirs. Includes Chanukah, Psalms, Biblical and Ethical Teachings and other sections. Featuring new works by such esteemed composers as Samuel Adler, Michael Isaacson, Bonia Shur, Linda Hirschhorn, Michael Horvit, Gershon Kingsley and many others. 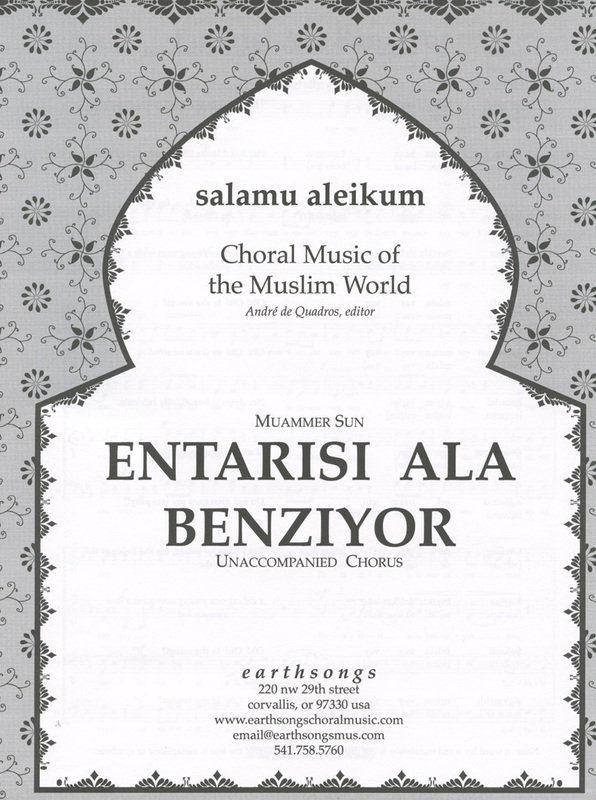 Muslim choral music? 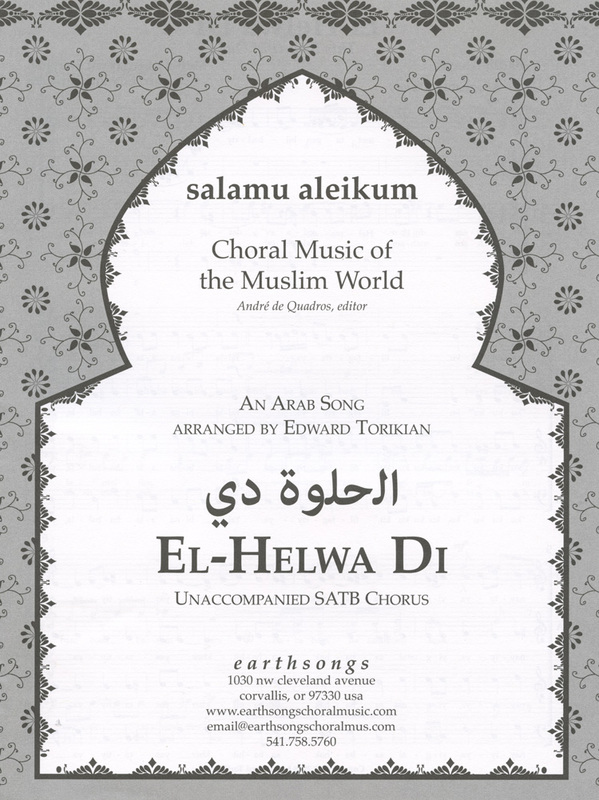 There are numerous examples of group singing in the Muslim world, almost all of which is non-notated. Many of these group singing genres date back several centuries, such as the genre of Arab music called the muwashshahat, a song tradition that started in Muslim Spain and has continued vigorously until modern times. While there are numerous examples of Muslim group singing, notated part-singing is a product of colonization, Westernization, Christianization, and now globalization. 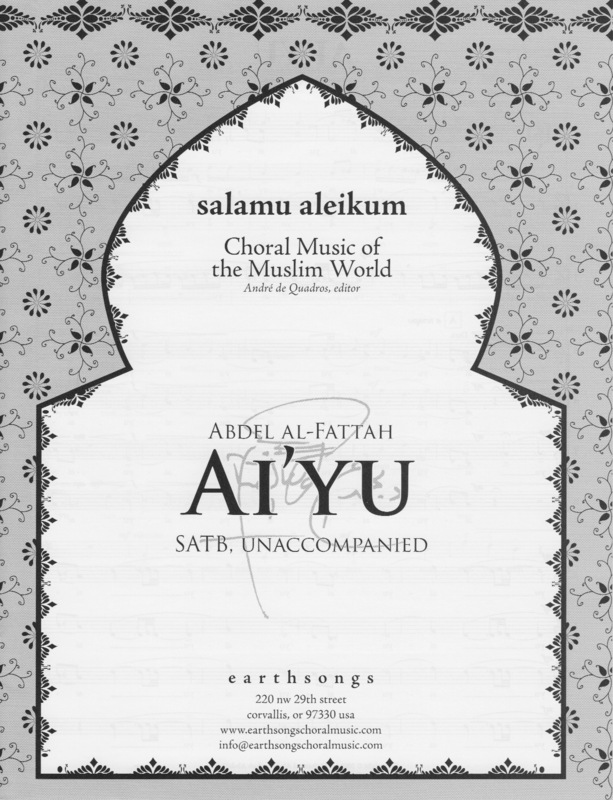 It is becoming increasingly popular for composers in the Muslim world to arrange and compose music for the Western-style choir, and this collection serves to introduce participants to the breadth of Muslim culture, some Muslim songs, and the great diaspora of music of the Muslim world through a selection of pieces from different social, and cultural contexts. Cantor Rena Shapiro's take on the Israeli classic "Eili, Eili" is a fantastic a cappella addition to any repertoire. The setting's savvy utilization of just three voices gives it lots of mileage with a beginning choir but provides plenty for an advanced one to work with in terms of expression and nuance. The piece includes sections in both Hebrew and English. The flowing, contrapuntal movement in Cantor Davidson's setting of Psalm 121 ("A song of ascents...") is at once modern and madrigal, and provides options for singing in English, Hebrew, or both. 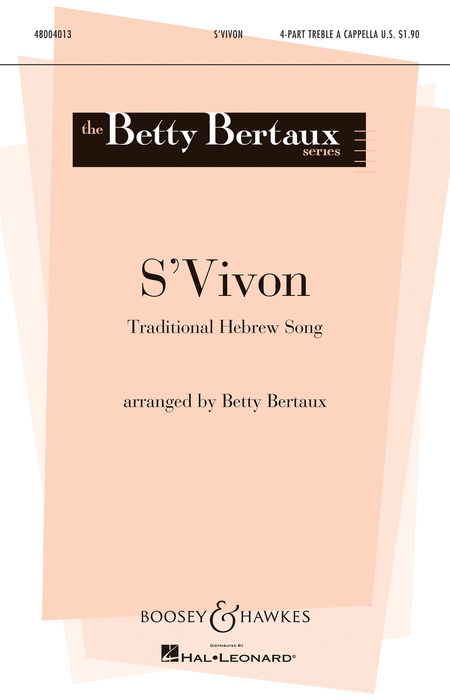 The song S'Vivon depicts the Hanukkah dreydl, a small top with four sides. Each side of the dreydl contains one of the four Hebrew initials of the phrase, "(A) Great Miracle Happened There." Culled from seven Tara publications, this collection of 62 Israeli, Hebrew/English, Hassidic and Liturgical songs includes chords, texts, transliteration and translations. Selections are arranged as two-part settings, but the collection is also a stand-alone songbook. Includes 45 popular Hebrew rounds as well. Displaying 1-50 of 54 items. 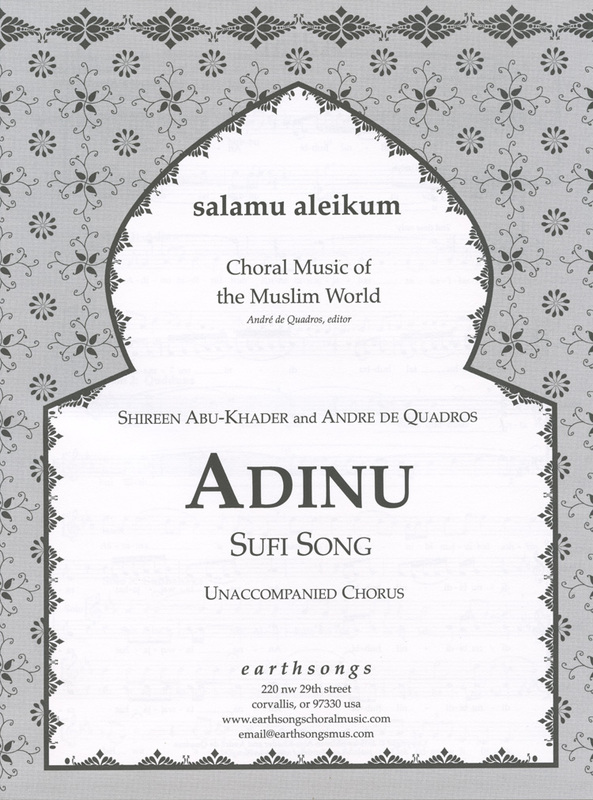 Arranged by Andre de Quadros and Shireen Abu-Khader, the text of this traditional Sufi melody is attributed to the Andalusian Moorish Sufi mystic, philosopher, and poet, Abu Abdillah Muhammad (1165-1240). He believed that love was the dominant universal force. He is, even today, a powerful symbol of inter-religious harmony. The word ai'yu (transliterated here from Arabic) is a term used by the people of Alexandria, Egypt. A distinctly secular term, ai'yu can take on a number of meanings but is used as a common exclamation of awe, excitement, and wonder. In this composition, Abdelwahab has taken his native knowledge of traditional Egyptian melody and ornamentation as the basis for new composition. Based on a biblical text, And Miriam Sang is a song of celebration following Israel's deliverance from Egypt through the Red Sea. It begins in a slow, chant-like manner, and soon shifts to an up-tempo dance-like mood. 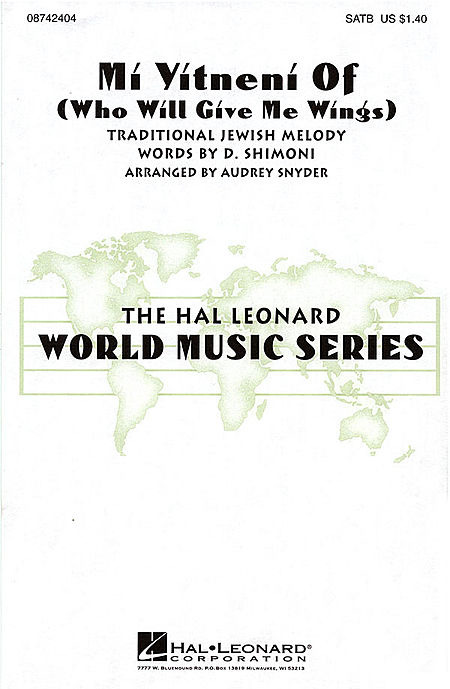 Although the melodies are original, they incorporate the augmented second interval and melodic formulas common to Hasidic and some Middle-Eastern music. The use of Hebrew text, tambourine and drums add to the authentic feel. Duration: ca. 3:15. Performed by Michigan State University Women's Chamber Ensemble, Sandra Snow, conductor. In America, this popular contemporary Jewish song is often performed slowly and peacefully, but in Israel, it is performed in a quick tempo, as it is in this arrangement. Featuring both Hebrew and English, it unfolds into a spectacular whirling and wordless dance. With clarinet obbligato (part included). Duration: ca: 3:25. This popular contemporary Jewish song is masterfully set by John Leavitt. As the simple, memorable Hebrew chorus is restated, the music unfolds in a rich and sonorous outpouring, supported by the authentic orchestration. Available: SATB, SAB, SSA, TTBB, Instrumental Pak, ShowTrax Cassette. Performance Time: Approx. 3:40. 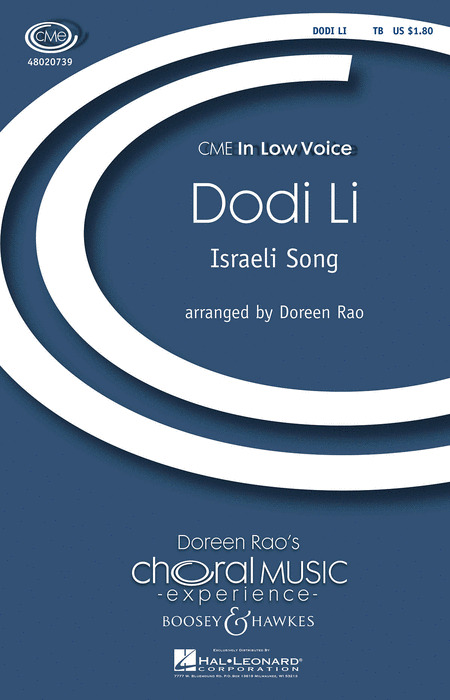 Dodi Li is a love song from the Old Testament book Song of Solomon. 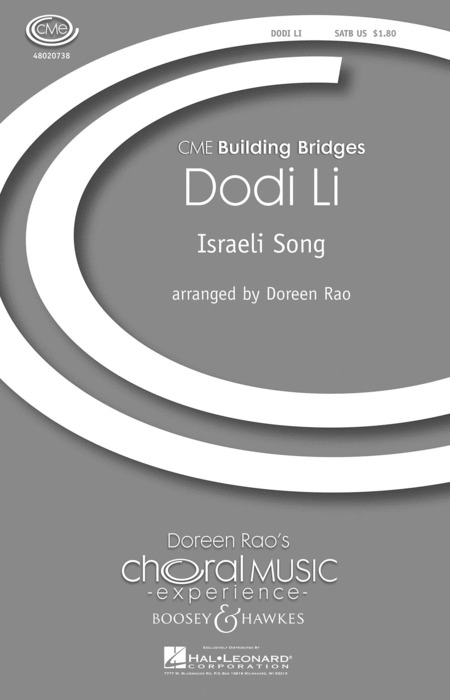 Now available in several voicings and sung completely in Hebrew, this delightful Israeli song, with its text based on a song from the Old Testament Song of Solomon, is an excellent multicultural experience for choirs. Both a pronunciation guide and translation are included in this selection that continues to be popular in festivals and adjudications nationwide. Duration: ca. 2:00. Now available in several voicings and sung completely in Hebrew, this delightful Israeli song, with its text based on a song from the Old Testament Song of Solomon, is an excellent multicultural experience for choirs. Both a pronunciation guide and translation are included in this selection that continues to be popular in festivals and adjudications nationwide.Duration: ca. 2:00. Jill Gallina has arranged this traditional Hebrew folk song, Dona, Dona, about learning of and treasuring freedom. The text is very refreshing, and will lead to discussion between teacher and students, and act as a springboard to musical interpretation. Its strong, bright style will make it a great selection for your multi-cultural needs. 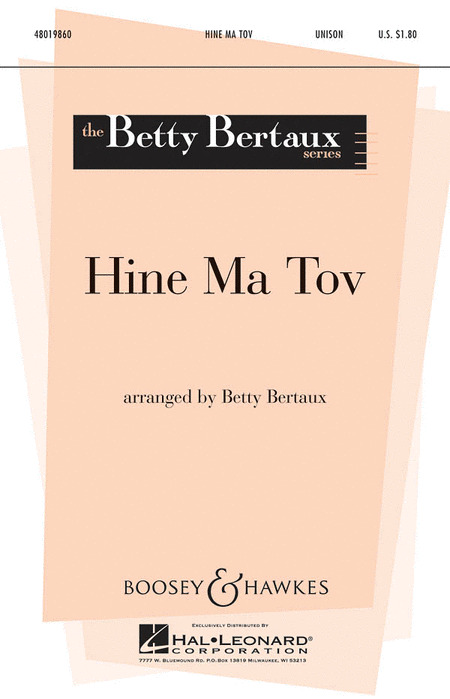 Cantor Rena Shapiro's take on this Israeli classic is a fantastic a cappella addition to any repertoire. The setting's savvy utilization of just three voices gives it lots of mileage with a beginning choir but provides plenty for an advanced one to work with in terms of expression and nuance. The piece includes sections in both Hebrew and English. The melody of the song El-Helwa Di was created by Eqyptian composer Sayyid Darwish, (1892- 1923) in Egyptian Arabic, to lyrics by Badih Khayri. 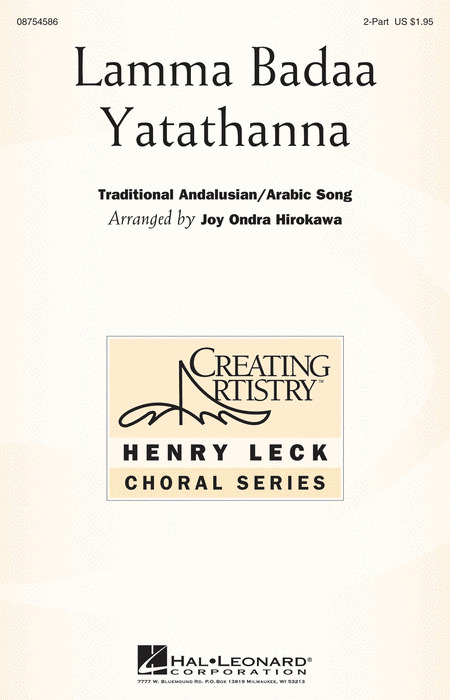 Torikian arranged this song for mixed chorus, a cappella, combining harmonic and contrapuntal styles, and rhythms and effects from different traditions. This song represents Egyptian life at the beginning of the twentieth century. Early in the morning, a beautiful woman wakes up to prepare the bread of the day. In the meantime, the sound of the rooster is heard-"ku ku ku ku"-and the entire neighborhood awakens. People begin to greet to each other happily. Their pockets are empty of money, but their mood is calm and peaceful, convinced that hope and patience are good virtues in life, and that God is always present in the hearts of poor people. This is an arrangement by Muammer Sun of a folk song, most likely from Istanbul or vicinity. There is also a Greek version of the song, suggesting the strong musical ties shared between the Greek and Turkish people. Entarisi features a heptatonic melodic orientation (6 notes, G to Eb) and a traditional rhythmic mode (2+2+2+3=9/8). Written by a quartet of women named VIDA and inspired by the stories of Sudanese basket weavers who expressed the pain and hope experienced by those in the famine of the 1980s, this is a most unusual and fascinating song. Arranger Culloton has captured all the pathos of the original version. A proven audience pleaser. Salim Bali heard the song Fo g Elna Khel for the first time in a Syrian Arab Television broadcast in 1966, when the great Iraqi singer Naa al-Ghazali was hosted in a special TV program in Damascus. 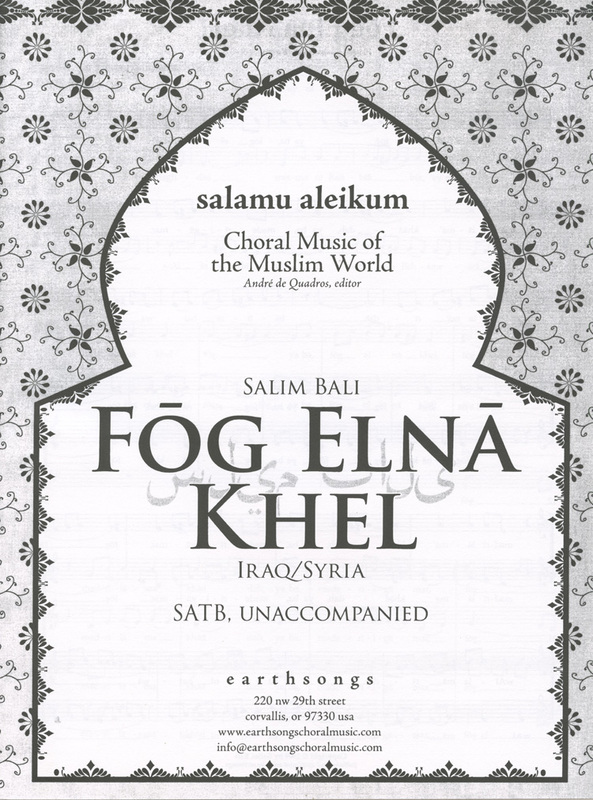 Initially, and as is the case with most Syrians, the homonymous nature of its title phrase led Bali to think that the words were "Fog el-Na khel" ("High above the palm trees"), despite the fact that the remainder of the lyrics did not have much to do with palm trees. This belief persisted until 2006 when a musician friend informed him of the little known fact that it really is spelled Fo g Elno Khel ("There above, I have an intimate friend"), which, in the Iraqi accent, is pronounced the same. 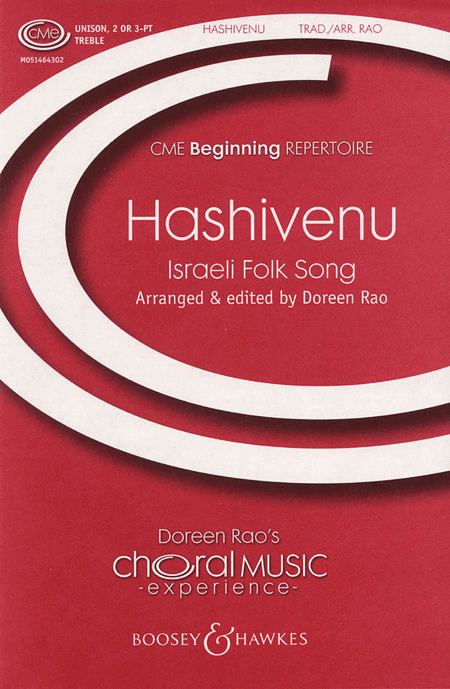 Hashivenu is a melodic and hauntingly beautiful Hebrew song. The sound and meaning of the text is fundamental to the expressiveness of the song. Contains two arrangements: one for unison voices and piano, and one for SSA a cappella in canon form. Israel's national song is presented here in a masterful setting by John Leavitt, unfolding in a rich and sonorous musical outpouring supported by a rich accompaniment. Available: SATB, SAB, SSA, Instrumental Pak, ShowTrax CD. Performance Time: Approx. 4:20. How good and pleasant it is that people live together in peace. This compelling Israeli melody with its Dorian nature, small range, stepwise motion, and repetitive text is perfectly suited for singers of all ages. The addition of a sparse piano accompaniment and varied percussion timbres complement the effect of an exotic tonal flavor. Duration: ca. 3:15. This ancient Hebrew text about unity still resonates with poignant significance. 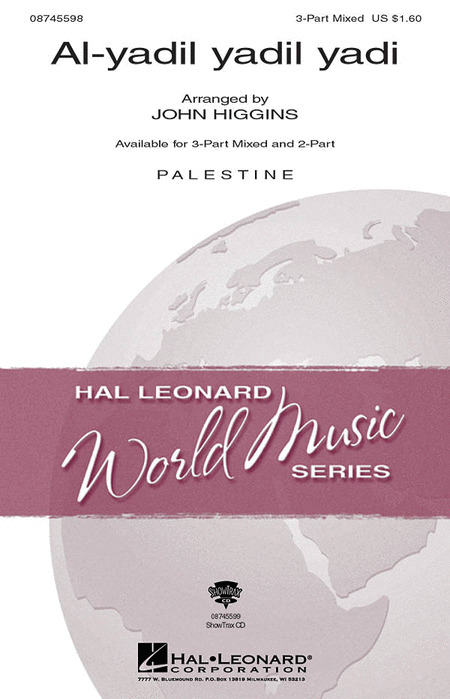 The distinctive sound of the Hebrew language as expressed through this hauntingly beautiful melody transports performers and audiences in a unique musical experience. A violin obligato has been added to this arrangement. Bright mixed meters, syncopation, hand claps and canonic imitation bring spirit and life to this accessible work for young and developing voices. The text from Psalm 150 is sung in accessible Hebrew and English: Let everything that hath breath praise the Lord. In Arabic, Koowu means strength. As a child, Maryam Sameer Faheem Khoury's father told her stories about the difficulties he experienced growing up in Palestine. Koowu is about how different her life would be if her father had not moved to the United States. The text of Koowu is symbolically about a caged bird who longs to fly away and find freedom. The modality of the melody hints at the composer's roots; the addition of a dumbek (drum) adds its own authenticity to the ethnic leanings of the piece. A colorful, unique addition to women's repertoire. Dumbek part available as a free download. Here is a traditional Andalusian/Arabic song arranged for 2-part voices (any combination), piano, optional violin, cello and dumbek, or any combination of these instruments. 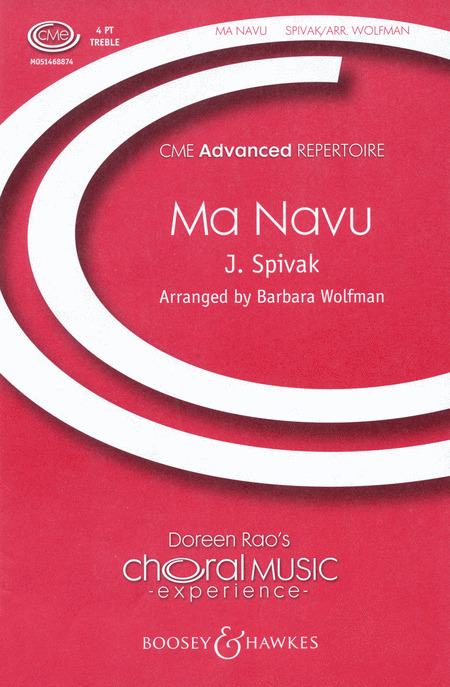 Very well crafted, it includes notated ornaments to achieve a more authentic performance as well as educational information, pronunciation, translation and instrumental parts. 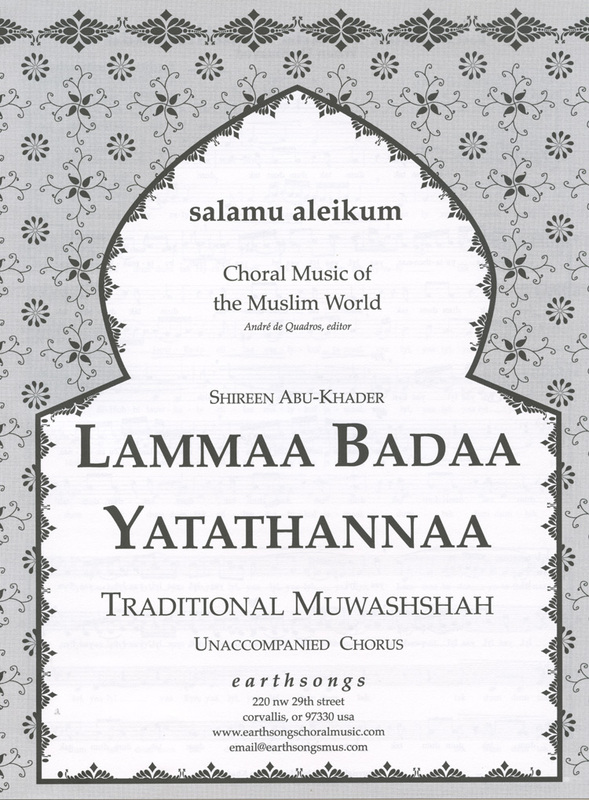 Shireen Abu-Khader's Lammaa badaa yatathannaa is a popular Arabic muwashshah. The muwashshah, a strophic form, originated in Cabra during the Muslim rule in Spain until 1492. Since then, this song type has spread throughout the Arab world where it survives in oral tradition. This folk song arrangement expresses the dispersed Jewish community's hope for reunion next year in Jerusalem. It is comprised of two distinct sections: a newly-composed, sorrowful theme, expressive of unrequited longing, and the traditional folk song itself, lively with excitement and hope. Celebrating peace, this Hebrew folk song will delight with its spirited accompaniment, bright and fun-to-sing vocals, and easy Hebrew text that create a round for 2-part and SAB voices. A wonderful multicultural performance for any time of year. This energetic Israeli folksong features the Isaiah text How beautiful are upon the mountains the feet of the messenger of good tidings: of salvation and peace. Available: SATB, 2-Part, 3-Part Mixed. Performance Time: Approx. 1:45. Ma Navu is known internationally as an Israeli folk dance. The melody's graceful flowing line is especially elegant in this setting for women's voices in four parts. This beautiful Israeli song is presented here in a masterful setting by Audrey Snyder, unfolding in a rich and sonorous choral tapestry. Optional violin, oboe, or other melody instrument. Available: SATB, SAB, 2-Part. Performance Time: Approx. 3:00. 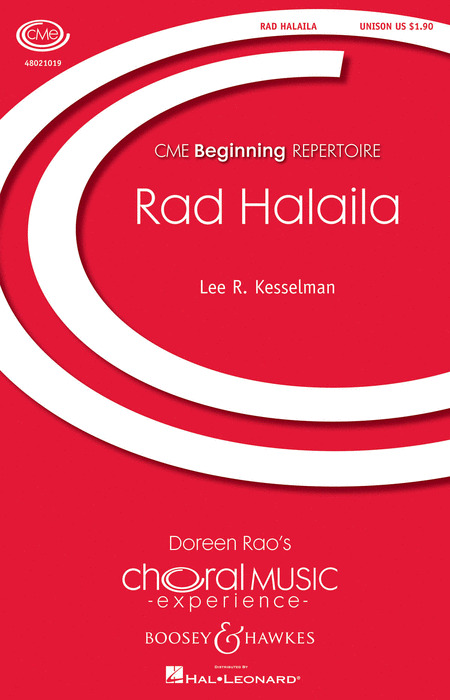 Commissioned by the St. Louis Children's Choir in honor of its 30th Anniversary, Rad Halaila is based on two well-known Hebrew texts with original music and the traditional Hava Nagila. The clarinet adds authenticity and interest to the performance. 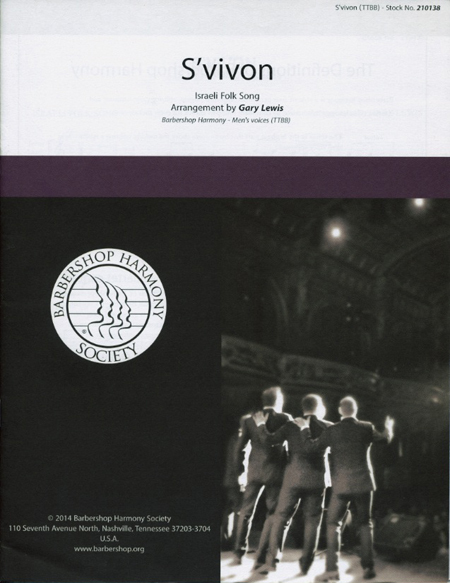 Scored for unison voices, this work is an excellent choice for developing treble choirs. Duration: ca. 5:00. 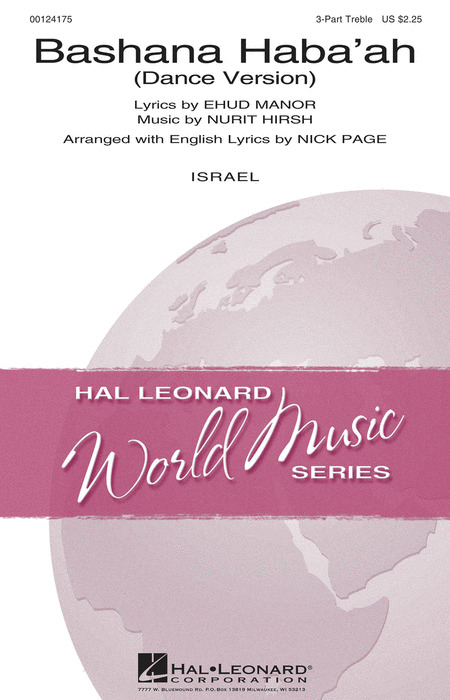 This Israeli folk song was originally arranged for The Men Of Independence by Gary Lewis who directs this award-winning chorus. The song S'Vivon depicts the Hanukkah dreydl, a small top with four sides. Each side of the dreydl contains one of the four Hebrew initials of the phrase, "(A) Great Miracle Happened There." This simple Hebrew prayer is a heartfelt prayer for peace. Perform with any combination of mixed, treble or men's voices with the expressive piano accompaniment or supplement with violin, percussion and bass, included in the octavo. For the more mature choirs, this is a Hebrew prayer traditionally said on Fridays upon returning from the synagogue. It depicts the dialog between an evil angel and a good angel and is in a broader sense a plea for peace - let it begin with you. Sung in Hebrew, there is an extensive pronunciation guide and an English text to assist the singers. With clarinet. Duration: ca. 4:50. The flowing, contrapuntal movement in Cantor Davidson's setting of Psalm 121 ("A song of ascents...") is at once modern and madrigal, and provides options for singing in English, Hebrew, or both. With a text from the Hebrew liturgy and based on a Jewish folk melody, this rich setting is a prayer for peace. Perform with the sensitive piano accompaniment or supplement with a small consort of violin, clarinet, cello and bass. Music has always been central to the existence of the Jewish people. These pioneer songs are full of Zionist zeal as they sing about the land they work, the celebrations where they dance, and their hope for the future. 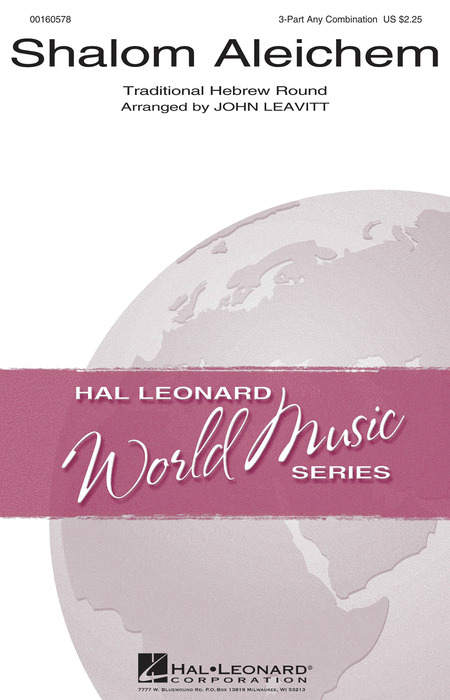 This music is important as the original scores were destroyed during World War II. These new scores come directly from the arranger's family. This melancholy Yiddish folk song was invested with a darker connotation during World War II, when it was popularly sung in the ghetto in Vilna, Lithuania. Kesselman's treatment of the song gives each verse a different vocal texture, while a piano accompaniment adds emotional intensity. The title of this Yiddish folk song informs us that a Balalaika will at least be inferred in the music. This wonderfully authentic arrangement does just that. It also includes a clarinet obligato (included in the back of the octavo) which is a tip of the hat to the Klezmer band. A Yiddish, phonetic and English text are all provided in the music allowing you to perform this work in any combination of Yiddish or English. 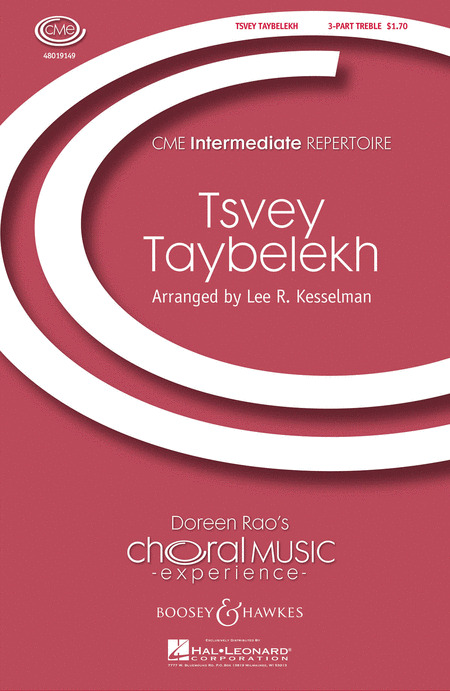 Expand your students' horizons with this arrangement of a popular Turkish folksong that depicts the colorful, energetic music of the Middle East. Well-crafted and effective in performance, it includes an easily learned section in Turkish with additional English lyrics, pronunciation guide and translation. With oboe and tambourine. Available separately: 3-Part Mixed, 2-Part, VoiceTrax CD. Duratiion: ca. 2:20.